The Mantle Update For Battlefield 4 is officially live and 1.23 GB in size. Here’s how you can update your game and enable mantle in-game. 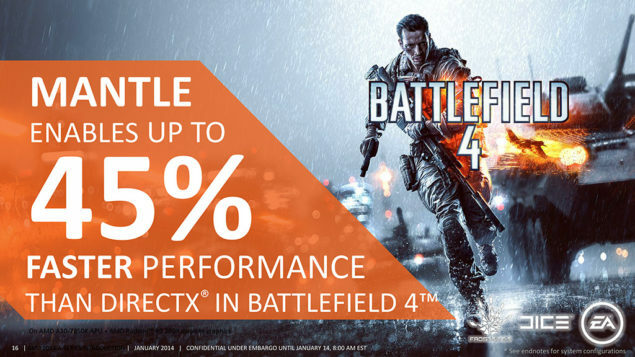 AMD has officially announced that the Mantle update for Battlefield 4 has arrived with the launch of the latest Catalyst 14.1 BETA driver. The AMD Mantle update would bring vast improvements to both AMD based CPUs and GPUs by digging in the core to directly gain access to resources for better utilizing of both the graphics card and processor. For example if you have a system where the the CPU is the main bottleneck, Mantle will give your frame rate a major boost compared to Direct X however if you already have a good cpu but a low end gpu, or a good cpu and a high end gpu, Mantle won’t affect performance alot. AMD Launches Mantle in Beta – Apparently its for Low End CPUs not GPUs. The AMD Mantle API is being developed for GCN enabled Radeon graphic cards and AMD CPUs which include the FX lineup and Kaveri APUs. This would allow developers to dig deep into the metal to bring console-level optimizations through ease of programming and faster optimizations over a coherent GCN chip architecture. This means that we would see better performance on the entire GCN architecture enabled AMD graphic card lineup ranging from the top Radeon R9 290X to the bottom R7 240. It should also be mentioned that Mantle also improves processor performance since very low tasks are handled by the CPU such as rendering, loading and streaming (tasked upon the GPU) so this allows perfect parallel rendering that allows utilization of upto 8 CPU cores found currently on AMD’s FX processors. This also helps avoiding potential bottlenecks for the system that may occur if the CPU is under load which in the case of Mantle won’t happen at all. I talked with a couple of other tech editors and we agreed that there was a slight miscommunication on the purpose of Mantle. The general intent of Mantle was thought to be an increase in GPU performance, but that is not exactly the case. What Mantle basically does is, that it removes a lot of the load from the CPU to allow the GPU to run at its true potential. AMD Coins this as CPU-Bound and GPU-Bound Scenarios. However if you are already the owner of a well rounded rig, Mantle wont bring any drastic change. And hey, i think this is actually better. This would actually make a rig require a less powerful CPU for the same performance, allowing you to focus on GPU upgrades. Mantle is an API that is thought to be a direct competitor to Microsoft’s Direct X and Open GL. It allows for a high number of Draw Calls to be submitted per frame resulting in higher performance. The problem with this statement is that it was interpreted to mean that it would make AMD’s Graphic Cards more efficient without the CPU being a factor. Because we now know that it is actually designed to reduce the workload of the CPU, comparison against Direct X changes completely. The new variable that comes into play for comparison is whether or not a game is CPU-Intensive. If a game is CPU intensive and you have a CPU that is not naturally capable of dealing with the load then Mantle will help you, if not then don’t expect miracles. PCPerspective was able to get official numbers directly from AMD which show the kind of improvement to expect from both Intel and AMD based hardware. The first one is Battlefield 4 (Which is not CPU Intensive) and the second one is the Star Swarm demo ( which is very CPU Intensive). As you can see in the first instance a high end GPU was coupled with a relatively low end processor. The game in question was not CPU Intensive, therefore it only resulted in a 23% increase. When a more powerful CPU was coupled with high end gpu, the performance increase was just 7.5%. CPU-limited scenario: 319% (1080p) and 281% (1600p) performance improvement in the “RTS” test on Extreme settings with the AMD A10-7700K and an AMD Radeon R9 290X. In this case an APU was coupled with a high end GPU in a very very CPU Intensive application. The result was simply amazing. It resulted in a 319% performance increase vs. Direct X. You can see just how effective Mantle is in helping out low end CPUs. However we were slightly disappointed that AMD did not give us the results of APUs Alone in CPU and GPU Intensive Scenarios with Mantle. AMD did a demonstration behind doors demonstrating the Co-Processing nature of the Kaveri APU. 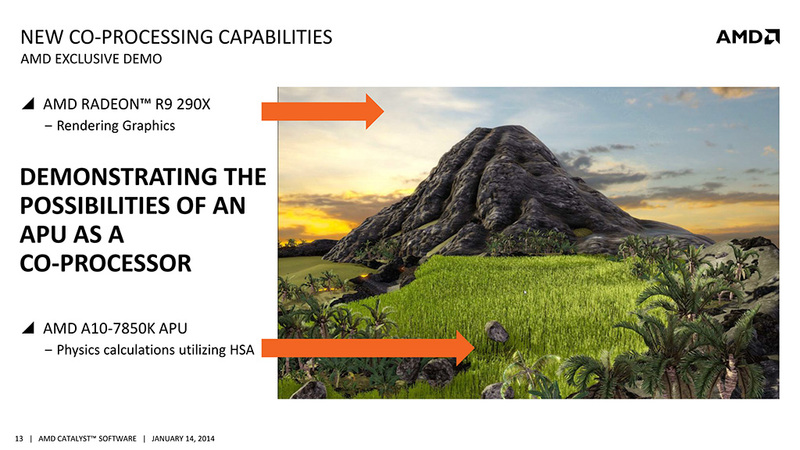 What basically happens is that the Radeon R9 290X will render the graphics while the A10-7850K would handle the physics calculations utilizing HSA as a Co-Processor. This is similar to the NVIDIA PhysX technology where you can set a second GPU as a PhysX Co-Processor. AMD has also boarded this train and seems to be going in the right direction. Although we don’t know what upcoming games will feature HSA support but does which do can see an increase in performance due to offloading of physics processing from the discrete GPUs over to the 12 Compute Units inside the A10-7850K. The Co-Processing features are really interesting for Kaveri plus the fact that 14.1 BETA Catalyst would officially bring HUMA support to enable the CPU, GPU and memory to work in complete harmony with a coherent unified link to each other. From what we have seen so far, Mantle will benefit the low-end spectrum of CPUS and APUs. Unless of course you have a rig that is not balanced properly (High end GPU + Low End CPU) then Mantle will work miracles. Thing is however that realistically speaking i would say that the average user can expect a performance increase of about 5 – 10% with Mantle at most. I suspect some of the users will be disappointed but at the end of the day, it would mean that AMD’s APUs get a major performance upgrade and as far as i am concerned, that more than justifies it. The Mantle download and the battlefield mantle patch should be available for download anytime today if not already.